CL USB Sync is a Palm webOS app that has custom tasks and memos modules. The app allows users to sync data from their PC to their Palm webOS phone using the USB cable that came with the device. The app also has a feature that allow users to quickly search their tasks and memos. Simply type in a word or phrase in the search bar and the results will list all the tasks or memos that contain that search term. 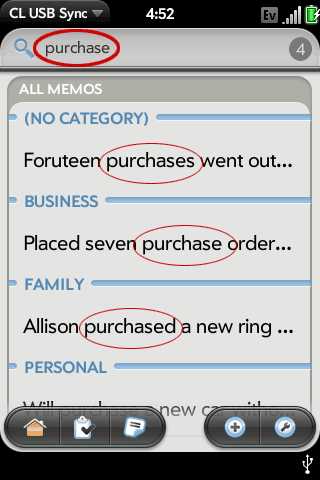 Users who rely on memos and tasks on Palm phones or in their PC software (like Palm Desktop or Microsoft Outlook) thrive on this search feature to quickly find what they need. This entry was posted in CompanionLink Products and tagged search, search memos, search palm webos, search tasks by Rushang. Bookmark the permalink.